The end of post-war prosperity coincided with unprecedented levels of public indebtedness, and it is difficult to disentangle these processes. The baby boom created demand for housing and schools but also for toys and furniture and a larger family car. The infrastructure to service these needs placed burdens on municipal, provincial, and federal governments that nevertheless became wealthy from development fees, property taxes, and income taxes. As the boomers aged into their late teens, demand increased for more university spaces, leading to the creation of nearly 50 new post-secondary institutions and the expansion of the 18 or so that had existed before 1950. A better educated and more skilled and flexible workforce fed new sectors of the economy while establishing a potential disaster plan should mass unemployment return. A predominantly middle-class economy meant less power in the hands of the nation’s trade unions, meaning that the postwar settlement might now be significantly amended by the state and employers. Public budgets, in short, had expanded in an unprecedented manner and with the onset of the OPEC crises, inflation, and stagflation, tax bases fell into decline, and debt levels became increasingly problematic. These were global changes, and the solutions and models were increasingly found on a global stage. The rise to power of Margaret Thatcher in the United Kingdom led to an end of the postwar settlement there, and to the privatization of assets like state-owned social housing. Her regime included a campaign for small government, the shrinkage of the welfare state, and a return to the sentiment that unemployment was the fault of feckless workers rather than a structural phenomenon. These perspectives derived from a set of ideas known as neo-liberalism that came to be known almost instantly as Thatcherism. An American version associated with monetarism and the trickle-down effect was led by President Ronald Reagan and, almost inevitably, was branded Reaganism. Canadian politicians — influenced by British and American political trends — began to make similar noises in Ottawa and in provincial capitals. As unemployment and interest rates moved upwards into double-digits for the first time since the 1930s, voters began looking to austerity-minded regimes. From 1979, the Social Credit party in British Columbia pursued an ideologically-charged Chicago School-inspired program of neo-liberalism under the leadership of William “Bill” Bennett (1932-2015). Ironically, Bennett’s father, W. A. C. Bennett, Premier of British Columbia from 1952 to 1972, was a lauded province-builder who had established two new universities, more than a dozen community colleges, countless schools, the first continuous highway from Vancouver to Alberta, a massive hydro-electric generation system, and several publicly-owned corporations and utilities that he nationalized. In the space of less than a decade, the political economy had changed dramatically from growing the state to shrinking government. In Ottawa this reorientation toward neo-liberalism was led by Conservative Prime Minister Brian Mulroney (b. 1939). Elected in 1984 and faced with a massive $86 billion deficit, the government set about reducing expenditures. Attempts to index Canada pensions and to control unemployment insurance pay-outs were attacked by the provinces and other critics, but Mulroney’s government endorsed reducing the size of the welfare state and took steps in that direction as well. In Ottawa and in the provincial capitals, the public sector unions came under attack as governments sought to reduce the size of their payroll. These themes continued into the 21st century. Deregulating the economy, downsizing the state, balancing budgets, reducing taxes, and liberalizing trade were all part of the neo-liberal strategy of the 1980s and 1990s. Since the end of Reciprocity in 1866, there has always been an element in Canadian business and politics that wished to see an end to tariff barriers between Canada and the United States. Macdonald’s government responded to American protectionism with tariffs of their own, and this was a fundamental part of the Conservative Party creed for a century. Liberal governments, by contrast, sought a return to reciprocity with greater zeal. Frustrated by negotiations with the Americans, Wilfrid Laurier’s government put free trade on hold until the 1911 election. With an agreement in hand, Laurier went to the polls and was roundly defeated. Even the Americophile Mackenzie-King could not bring free trade back onto the table, although the Ogdensburg Agreement (see Section 6.13) did much to tie the two economies together. The United States emerged from the Second World War as Canada’s biggest market and, conversely, Canada was the largest importer of American goods. (This continues to be the case: more than 62% of our exports go to the United States, and 45.5% of our imports come from south of the border.) The trade barriers in place kept branch plants thrumming along, so Liberals saw little need for change. The economic nationalism of the 1960s and 1970s called for more barriers, rather than fewer. Given this history and the context, Prime Minister Mulroney’s decision to pursue free trade with his fellow neo-liberal, United States President Reagan, was a major change in direction. The first Free Trade Agreement (FTA) in 1987 reduced tariff barriers and raised fears of manufacturing jobs moving south of the border. It also raised concerns about the saturation of Canadian media with American television and radio programming. The immediate effects of the FTA are difficult to identify: some 200,000 jobs were lost in manufacturing in the early 1990s, but this may have been due more to a series of economic crises unrelated to the FTA. Canada’s cultural industries did not disappear, although some institutions — the CBC, Canadian theatre, and a homegrown film industry — might have done better without free trade. If a line may be drawn at this time (and economic historians are still very much undecided), it would favour the emergent high-tech industries in Canada (which did very well) and not the old heavy manufacturing sector whose decline led to the creation of a rust belt. Whatever the short term impacts, the FTA was not rolled back. It was hugely unpopular in the 1988 general election (in which the NDP and the Liberal Party nevertheless split the anti-Conservative vote), and it was unpopular again in the 1993 election that saw Mr. Mulroney’s successor, Kim Campbell, defeated (see Sections 12.2 and 12.3). A Liberal government was returned under Jean Chrétien, but there was no reversal in the tariff policy. Mulroney and Campbell had negotiated a successor treaty to the FTA, the North American Free Trade Agreement (NAFTA), which added Mexico to the partnership. Chrétien’s commitment to renegotiate (if not tear up) the FTA and NAFTA came to little more than a few amendments, and NAFTA went forward in 1994. The Liberals were once again the party of free trade. Protectionism (the legacy of a century of Conservatives) was now the virtual monopoly of the New Democrats. The FTA and NAFTA stimulated a cross-border movement of goods, but so too did the dollar. The Canadian dollar traded poorly against the American dollar through most of the 1980s and 1990s. Allowed to float since the early 1960s (apart from one brief return to fixed rates), the trend was progressively downward until it hit $0.63 in August 1998. Further depths would be plumbed in the early 21st century. A cheap dollar, of course, means that Canadian exports do well, but the cost of imports (which increasingly includes food) does not. Again, it is difficult to isolate the effect of changing currency values from that of the free trade agreements. In the very year that the FTA was signed, the Japanese car manufacturer Toyota opened its first two North American plants, one of which is in Cambridge, Ontario. Within a decade of its first vehicle rolling off the assembly line, the plant produced a million vehicles. The rising cost of importing foreign-made vehicles (caused by the falling dollar) made Canadian manufacturing viable; the FTA made it possible to sell as much as two-thirds of the Cambridge output into the Unites States. Cheaper (and less organized) plant labour also served to make the Toyota operation a success. Yet, while this kind of manufacturing was increasing, industrial production in Canada as a whole was falling. By the mid-1970s, the share of GDP contributed by manufacturing had collapsed from an all-time high in the Second World War to a level comparable to the Depression. The movement of investment and employment out of manufacturing was well underway. Canada’s manufacturing share of GDP troughed in 1982 at about 16%. Indexed to 1961 as a base year (=100), relative employment in manufacturing shrank by more than 40 points by the mid-1990s, and by about 50 points in 2004. Part of this decline can be explained by greater automation and a fall in relative prices; part may be explained, as well, by the enlarged share of GDP captured by other sectors, including the service sector. Regardless, the move away from an old-style industrial order — a process called deindustrialization — was clearly underway. The electrical products industry in Canada — associated so strongly with household appliances like washing machines, refrigerators, and sound equipment — was already competing badly against American competitors, but even branch plants like General Motors and General Electric faltered when faced with the new competition from abroad. The auto industry in central Canada — along with its sibling plants across the border — sputtered along while Japanese “imports” established more successful, less expensive, and more fuel-efficient products on the market. Shiploads of automobiles began arriving in Canada from Asia and Europe in these years, transforming harbourfronts on the Pacific and Atlantic. Canadian ports were also reorganized in the 1970s and 1980s to handle shipping containers rather than bulk goods. Fewer auto-plant workers and fewer longshoremen (aka: stevedores) were needed, and the same was true for steel producers and machinists. The industrial revolution with which Canada was launched in the 1860s was retreating in the face of off-shore production and outsourcing, increased automation of manufacturing, improved oceanic and air transportation of freight, and the reduction of state involvement in the economy as a whole. Falling fertility rates resulted in reduced consumer demand for goods as market saturation points arrived. For example, dishwashers could be found in 26% of Canadian households in 1979, rising to 38% in 1986. Clearly there were opportunities for greater market saturation for that product, but the other key appliances — refrigerators were in nearly 100% of Canadian households from 1976, if not earlier — had reached their ceilings and were being replaced only slowly. At the same time, the oil economy in Canada was becoming stronger, and economic and political power was shifting to what was commonly called the New West (see Section 8.10). 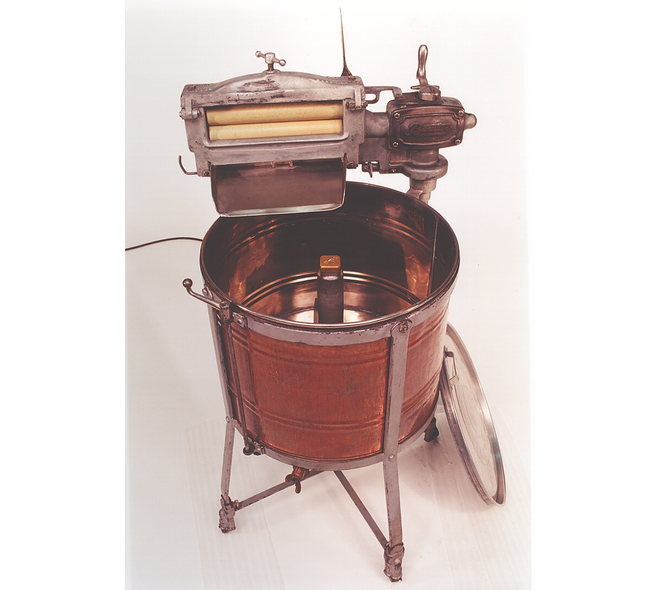 Figure 8.23 A pre-WWII washing machine produced by Beatty Brothers. Note the wringer – or mangle – in which children’s fingers are going to get squished. The Beatty Brothers firm provides a neat overview of the history of industrialism in Canada since Confederation. Established in Fergus, Ontario in 1874, it initially specialized in farm equipment. (Their first plant was in a building that became known later as the Old Temperance Hall, an interesting overlap with one of the leading reform movements of the day.) In 1879 they moved to a new purpose-built plant on the Grand River that gave them access to water power. In 1911 they moved again, this time to a steampowered factory that included extensive office space — thus, managerial and clerical transformations were keeping pace with technological change. At around the same time, Beatty Brothers shifted their focus away from farm implements to barn equipment. This change presumably reflected the end of the pioneering days of the Prairie West and the coincidental expansion of the dairy industry. It was a small step to go from one indoor line of products to domestic needs. 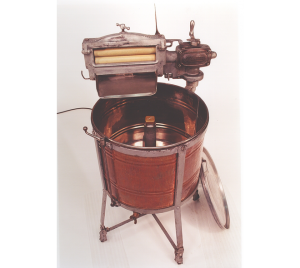 Pioneers in the design and production of mechanical washing machines in the interwar years, the Beatty brand could be found in households throughout Ontario and the rest of Canada. Beatty Brothers benefited from tariff barriers that kept out cheaper American manufactures, but they suffered as those same barriers encouraged the establishment of branch plants north of the border. In the post-WWII era, American producers like General Electric and Westinghouse had greater economies of scale and were able to dominate production and distribution from the 1950s through the 1960s. Beatty Brothers disappeared when it was bought by General Steel Wares (GSW) in 1969 in a wave of consolidations that would see many smaller producers vanish. Through the 1990s, the Canadian economy continued to adjust to what was clearly becoming a globalized marketplace. The end of the Cold War and the fall of the Iron Curtain opened eastern European markets to the West for the first time since before 1939. Similarly, economic liberalization in the People’s Republic of China created new opportunities and witnessed accelerated trade between the Pacific Rim ports. This new development augmented the rise of other “Asian Tiger” economies led by Japan and South Korea. While Canada exports high value service products (like international education) to markets in Asia, it also continues its dependence on traditional commodities by exporting unprocessed (or barely processed) forest products, grain, coal, gas, and oil. In return, Canada imports automobiles from Japan and South Korea and high tech equipment from across southeast Asia. This new economic revolution of the 1990s saw steel mills, coal mines, and auto plants in Ontario and Nova Scotia shuttered. The pattern was repeated across the whole spectrum of manufactured goods, as Canadian shoe, clothing, and textile producers moved production elsewhere or simply went bankrupt. The end of the economic boom in the 1970s facilitated the growth and popularity of neo-liberal responses to debt, and a strategy of shrinking the public sector. Efforts to improve the economy included a new version of reciprocity: the FTA and NAFTA. A long term shift out of manufacturing accelerated in the 1980s and 1990s as global competitors entered the Canadian marketplace and competition for capital investment increased. Deindustrialization was a narrowing of manufacturing diversity and a shedding of jobs in the secondary sector. Washer, wringer is in the public domain. This image is available from Canada Science and Technology Museums Corporation under the reference number 1977.0307.001. 8.16 The New World Economic Order by John Douglas Belshaw is licensed under a Creative Commons Attribution 4.0 International License, except where otherwise noted.